The ultimate game of cat-and-mouse is played out in a cozy English country house owned by a celebrated mystery writer. A Tony Award winning whodunnit with twists at every turn, this spell-binder will keep you on the edge of your seat! Why are mysteries so fascinating? I grew up reading Hardy Boys/Nancy Drew Mysteries. I couldn’t get enough of them. Later, I became hooked on television mysteries and crime series. I would plan my days and nights around Murder, She Wrote; Columbo and Perry Mason reruns. Then I became obsessed with audio mystery books, of which, when I found a writer of interest, I would find myself compelled to buy or borrow from the library the entire series ( . . . it’s been years and I’m still waiting for Sue Grafton’s Y and Z). So, it’s no surprise that I love good stage mystery/thrillers. I’ve directed seven, this is my eighth. The plots are logical, linear architectural gems. One event leads to another taking us on a roller coaster ride full of twists, turns, climbs and plunges. There are no superfluous subplots. Everything that happens contributes to the main story line, which stays on track from beginning to end (even “red herrings” are woven into the forward motion of the play). The genre speaks to something central to us all. It answers vital questions about identity and reason, and, life and death, that can make the world more rational and sensible. It gives us peace of mind. Great mysteries create order out of chaos with good winning over evil. Solving mysteries and puzzles gives us a sense of closure, accomplishment and reassurance. For those of you who have never seen Anthony Shaffer’s Sleuth, be prepared for one of the greatest roller coaster rides of comedy mystery/thrillers. Nothing is what it seems . . . even at third glance . 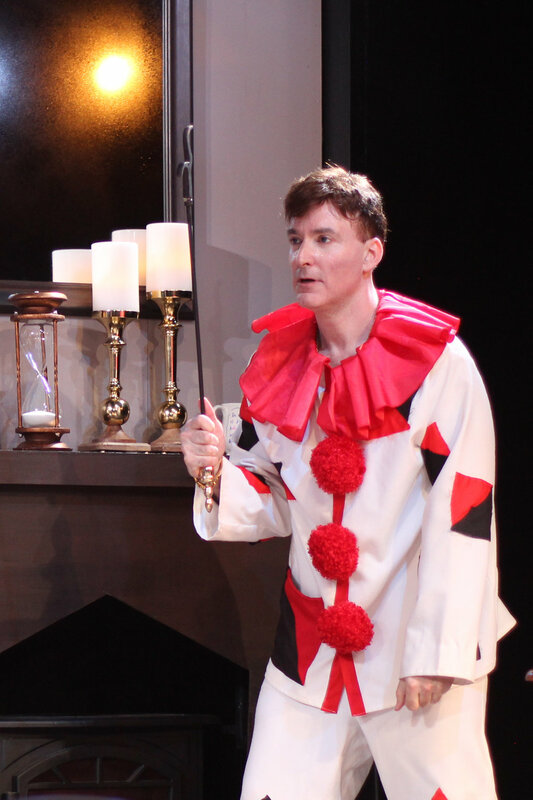 . .
Music Theatre of Connecticut MainStage, Fairfield County’s professional award-winning theatre company, continues its 30th Anniversary Season with a production of the thriller Sleuth. The play will run November 4-20. 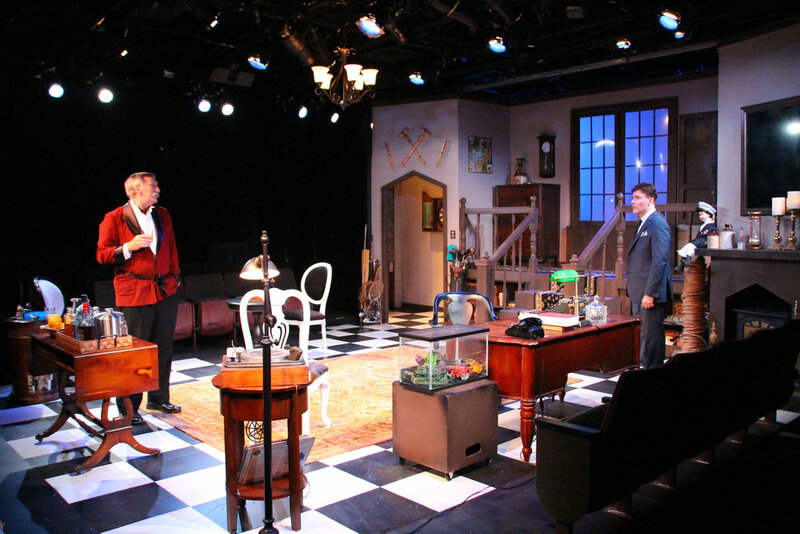 Staged in a cozy 110-seat theatre, this production of Sleuth offers audience members the intimacy of a local theatre with the professionalism of Broadway -- an experience only MTC MainStage can provide. Sleuth, a play by Anthony Shaffer, is the ultimate game of cat-and-mouse, played out in a cozy English country house owned by a celebrated mystery writer. A Tony Award-winning whodunnit with twists at every turn, this spell-binder will keep you on the edge of your seat. Other works by Anthony Shaffer include the play Murderers, as well as the screenplay adaptations of Agatha Christie’s Death on the Nile and Evil Under the Sun. The cast features David Brickman, a dual UK/US citizen and third generation thespian, who has been acting since age six. His recent stage credits include Arthur Miller in Marilyn in NYC, as well as Richard in The Lion in Winter and Sky Masterson in Guys and Dolls. Brickman has also appeared in numerous films and commercials, with television credits including General Hospital, 24 and voiceovers for BBC America. John Little previously appeared in the MTC MainStage production of Ancestral Voices, and recently performed in the Roundabout Theatre Company National Tour of Cabaret. Other Connecticut regional credits include A Woman of No Importance and Major Barbara at Yale Rep, The Seven Year Itch and An Inspector Calls at Ivoryton Playhouse and Glimmerglass at Goodspeed. Little’s television credits include Boardwalk Empire and Law and Order. The cast of Sleuth also features three actors making their MTC MainStage debut: Philip Farrar, who appeared as Daddy Warbucks in Annie 2 at Blackpool Music Circus; Harold K. Newman, who appeared in Oklahoma! with St. Bart’s Players in NYC; and Roger Purnell, who appeared in Committed at McGuffin Ensemble Theatre. Sleuth is directed by Pamela Hill, who has returned to MTC MainStage, where she previously directed the Connecticut Critics’ Circle nominated Vanya and Sonia and Masha and Spike, as well as Rodgers and Hart and Side by Side by Sondheim. An award-winning director, Hill has worked at Cincinnati Playhouse in the Park, Contemporary American Theatre Company, The Human Race Theatre Company, Short North Stage and Actors’ Theatre. Among the favorite mysteries she has directed are The Real Inspector Hound, Night Watch, Wait Until Dark, Prescription: Murder, Dial “M” for Murder, Deathtrap and The Mousetrap. The design team includes set design by Jordan Janota, lighting by Michael Blagys, costumes by Diane Vanderkroef and fight direction by Dan O’Driscoll. The production is stage managed by Jim Schilling. The MTC MainStage 30th Anniversary Season will continue with It’s a Wonderful Life: A Live Radio Play (December 9-18), I’ll Eat You Last: A Chat with Sue Mengers (February 24-March 5, 2017) and End of the Rainbow (April 7-23, 2017). JOHN LITTLE (Andrew Wyke) is delighted to return to MTC MainStage, where he appeared in Ancestral Voices. Most recently John was in the Roundabout Theatre Company National Tour of Cabaret. Regional credits include eight seasons at The Shakespeare Theatre of New Jersey; A Woman of No Importance and Major Barbara at Yale Rep; The Seven Year Itch and An Inspector Calls at Ivoryton Playhouse; and Glimmerglass at Goodspeed. He's also appeared in My Fair Lady at Pittsburgh Public Theatre, Annie at Pioneer Theatre, A Christmas Carol, The Woman in Black and Noises Off at Portland Stage; and As You Like It at Philadelphia Shakespeare Theatre. Off-Broadway he's played in The Taming of the Shrew, Christopher Columbus, Hamlet and Poetic License. John toured Europe in Crazy for You, A Christmas Carol and Harold and Maude, and Asia in Cabaret. American tours include The Fantasticks, Scrooge and Angel Street. Television work includes Boardwalk Empire and Law and Order. John is a graduate of the Yale School of Drama. PHILIP FARRAR (Inspector Doppler) is pleased to be making his MTC MainStage debut with Sleuth. 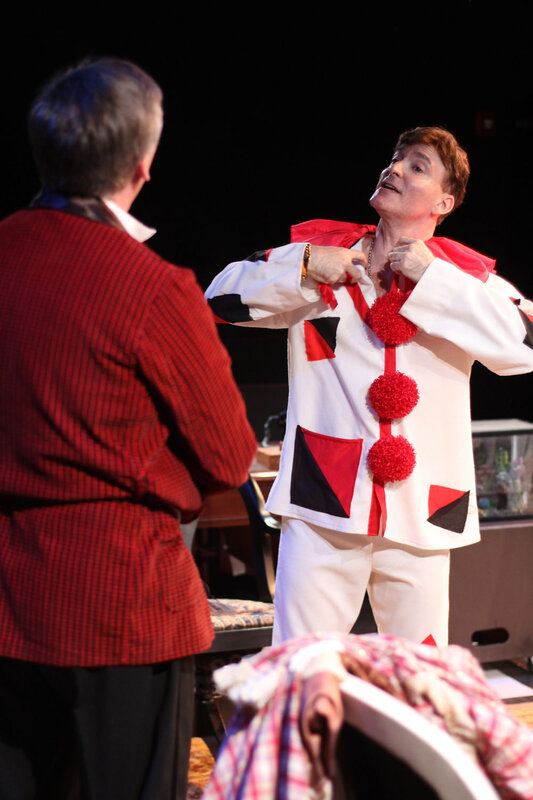 A graduate of The Salisbury Academy of Dramatic Art, Mr. Farrar has appeared in many venues across the UK. Favorite roles include Daddy Warbucks in Annie 2 (Blackpool Music Circus), Mr. DePinna in You Can’t Take it With You (Henley-on-Thames Dinner Theatre), and Ralph Thomas in Excuse Me, Madam (Salisbury Playhouse). Television roles include Police!, and Ground Force with Alan Titchmarsh (Participant) both on the BBC. 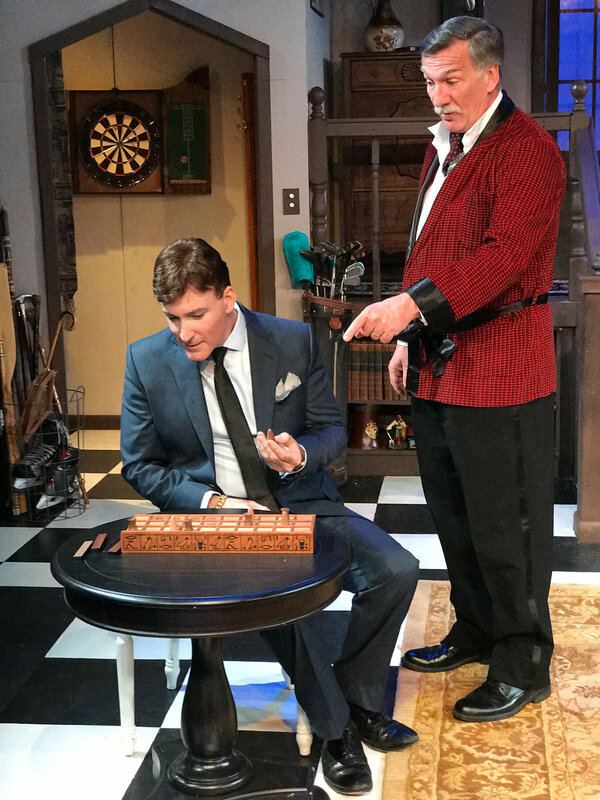 HAROLD K. NEWMAN (Detective Sergeant Tarrant) is happy to make his Connecticut acting debut in MTC MainStage’s Sleuth! He has previously appeared as Cowman in Oklahoma! and Jim in Green Willies with St. Bart’s Players in NYC. Harold dedicates his performance to his high school acting teacher, Miss Hanna, who directed him in his first stage role as Captain Queeg in The Caine Mutiny Court-Martial. Enjoy the show! ROGER PURNELL (Police Constable Higgs) is a Kenosha, Wisconsin native who recently moved to New York City. Favorite productions include Committed (Sparkle Motion Dance Company), Butch Has Three Mommies (Stonewall Theatre), and the controversial all-male production of Clare Booth-Luce’s The Women (Glue Factory Theatre of Brooklyn). 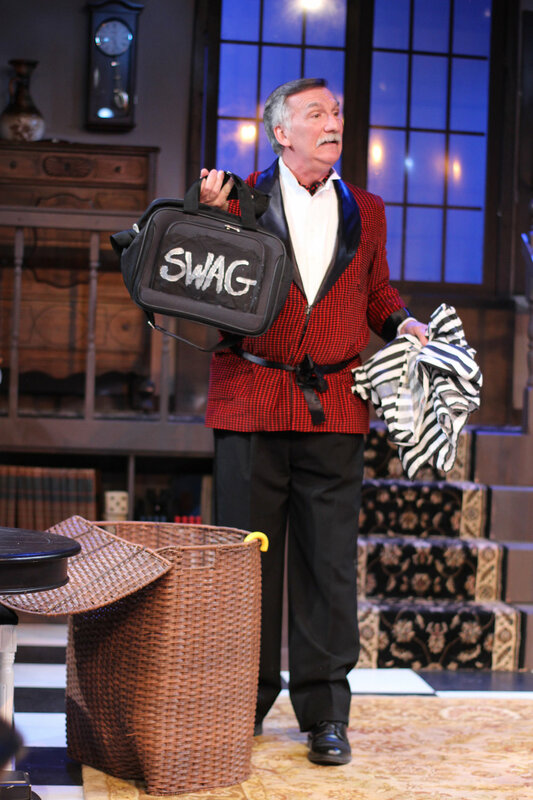 Roger is thrilled to be part of MTC MainStage’s Sleuth! PAMELA HILL (Director) is delighted to return to MTC MainStage, where she has previously directed the Connecticut Critics’ Circle nominated Vanya and Sonia and Masha and Spike, as well as Rodgers and Hart; and Side by Side by Sondheim. An award-winning director, Pam has worked at Cincinnati Playhouse in the Park, Contemporary American Theatre Company, The Human Race Theatre Company, Short North Stage and Actors’ Theatre. Among the favorite mysteries she has directed are The Real Inspector Hound, Night Watch, Wait Until Dark, Prescription: Murder (a stage version of the pilot episode that introduced Lt. Columbo), Dial “M” for Murder, Deathtrap and The Mousetrap. She has also guest directed or taught at numerous universities including Wittenberg, Denison, Bradley and The Hartt School. Pam has degrees from Otterbein and BGSU, and trained at Actors Theatre of Louisville and RADA in London. ANTHONY SHAFFER (Playwright) was educated at St. Paul's, and Cambridge University. From 1951 to 1955 he practiced law as a barrister, and subsequently, until 1969, was a partner in a successful film production company, scripting, directing and producing many television commercials. In 1969, Mr. Shaffer resigned to take up writing full time and, in 1970, Sleuth appeared. It was one of the greatest theatrical hits of all time in London, New York, and throughout the world, winning the Tony Award for Best Play of the Year. Other stage plays include This Savage Parade (revived in 1963 and revised in 1987), Murderer (1975), Widow's Weeds (1977) and The Case of the Oily Levantine (1979), which was presented in New York in 1982 under the title Whodunnit. In 1972, he wrote the screenplay for Forbush and the Penguins, starring John Hurt and Hayley Mills and, in 1974, turned Sleuth into a film starring Laurence Olivier and Michael Caine. That same year he wrote the screenplay for the Alfred Hitchcock film, Frenzy. Other screenplays include The Wicker Man and Absolution, starring Richard Burton, and three Agatha Christie adaptations: Death on the Nile, Evil Under the Sun and Appointment With Death, with Peter Ustinov as Hercule Poirot. Mr. Shaffer developed the storyline for the film Sommersby, starring Jodie Foster and Richard Gere. Anthony Shaffer died on November 6, 2001. Mr. Shaffer's autobiography, So What Did You Expect?, was published in 2002. Sleuth is presented by arrangement with Samuel French, Inc.